Stephen Graham Jones -- "After the People Lights Have Gone Off"
Stephen Graham Jones will speak about and sign his new book, After the People Lights Have Gone Off, on Wednesday, January 21st at 7:30pm. About the Book: The fifteen stories in After the People Lights Have Gone Off explore the horrors and fears of the supernatural and the everyday by one of our most beloved horror writers, Stephen Graham Jones. Included are two original stories, several rarities and out of print narratives, as well as a few "best of the year" inclusions. With an introduction by Edgar Award winner Joe R. Lansdale, and featuring fifteen full-page illustrations by Luke Spooner, After the People Lights Have Gone Off gets under your skin and stays there. Stephen Graham Jones -- "Not for Nothing"
Stephen Graham Jones will speak about and sign his new book, Not for Nothing, on Wednesday, April 30th at 7:30pm. About the Book: Not for Nothing, the new novel from local author and CU Professor Stephen Graham Jones, is written in second person. The town the novel is set in is Stanton, Texas, population three thousand; the private investigator is disgraced Midland homicide detective Nicholas Bruiseman, who is so down on his luck that he is forced to take a job as a live-in security guard for the town's lone storage facility. This is his new life—starting over with nothing in the town he grew up in. We'll enjoy beverages at this event courtesy of the good folks at Saint Arnold Brewing Company. It was a fire that could be seen for miles, a fire that split the community, a fire that turned families on each other, a fire that it's still hard to get a straight answer about. A quarter of a century ago, someone held a match to Greenwood, Texas's cotton. Stephen Graham Jones was twelve that year. What he remembers best, what's stuck with him all this time, is that nobody ever came forward to claim that destruction. And nobody was ever caught. Greenwood just leaned forward into next year’s work, and the year after that, pretending that the fire had never happened. But it had. This fire, it didn't start twenty-five years ago. It had been smoldering for years by then. And everybody knew it. Getting them to say anything about it's another thing, though. Now Stephen's going back. His first time back since he graduated high school, and maybe his last. For answers, for closure, for the people who can’t go back. For the ones who never got to leave. Stephen Graham Jones's book Mad Hatters and March Hares was available from LibraryThing Early Reviewers. 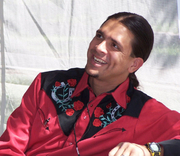 Stephen Graham Jones is currently considered a "single author." If one or more works are by a distinct, homonymous authors, go ahead and split the author. Stephen Graham Jones is composed of 3 names. You can examine and separate out names.